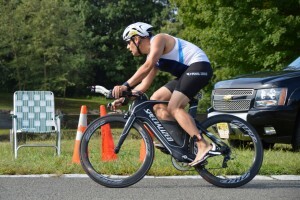 Last September some friends and I took part in the 29th annual 2015 Skylands Sprint Triathlon held at the Spruce Run Recreational Area in Clinton , NJ. I was back here to try and redeem myself against my younger brother, who was also here. This has become our annual bragging rights triathlon rivalry, and after getting caught on the run and losing by 3 minutes last year, I was hoping for a better performance. The race is organized by the Northern Hunterdon Rotary organization who do an outstanding job and its a great charity event for Operation Chillout (supporting homeless Veterans) and local Special Olympics . 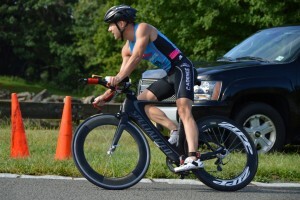 This is also a USAT sanctioned race, and with very visible officiating presence particularly on the motorbikes throughout the bike portion. The race comes in two distances the sprint and the Olympic which is basically the Sprint x 2. 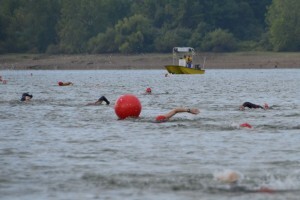 The Olympic distance races starts first about 30 minutes prior to the sprint race. Only when most of those swimmers are nearly done with the swim, do the officials move in the bouys back in and the water safety folks re-position themselves for the shorter swim . 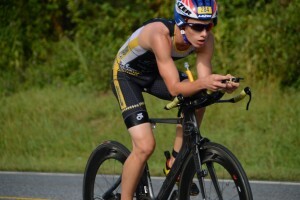 I was in my brothers wave this year , also there was up and coming kid phenom Bobby Hammond this was just a warm up race for him as ITU world age group championships were later in the week. Its a running beach start so you can get some separation. From there is was a pretty uneventful swim, caught the legs of some other swimmers, but the pesky goggles kept leaking forcing me to stop and purge water from them a bunch of times, I need better google, have head leaky issues all season. The turnaround bouy came pretty quickly , there was a little bit of a bunch up near it, but then it was just heads down and heading back to shore. 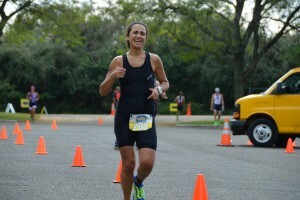 Once you hit the beach , its another 400yd run from the beach to T1, this year I had a bit of trouble finding the wetsuit zipper, spent most of the time, running with my arm behind my back grasping from the zipper leash, but eventually got it. 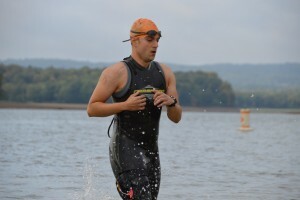 My brother would later tell me of his anxiety before the swim and he considered bailing right at the start, but he was a trooper and toughed out the half-mile swim. He said his swim was similarly difficult as last year’s which means it was a slightly less harrowing for him, but still exhilarating. Then I hopped on the TT bike (I elected to go with the TT this time) , out of T1 the first mile there’s a false flat and immediately I recognized I did not have much snap in my legs, not sure why, was passed by a few comparable folks early on… But I just kept pressing on knowing that the climbing was about to begin. My brother came out of the water a few minutes back, but hap a bad a painful crap slowing his transition. The ride is mostly out of the park via Van Syckles road, and there is a short gradual climb before you get a gradual drop onto a flat section before turning right onto Route 173. At this point at about mile 3, you begin the climbing, pretty gradual at first 2-4% gradient, then next to the gas station you make a right, and it drops a little bit, before reaching the main climbing section of the course, starting at about mile 5. As I approached mile 5.2 on Stoltz Road, the serious climbing starts right before the right -left turn onto Mountain View Road. That’s where you see the distinctive incline. the climb up Mountain View road. Just as I turned onto Stoltz road the men’s Olympic distance race leader passed me , followed closely by the lead Referee moto. I have an action cam video of it and it gives you a very visual difference of what someone with a strong Watt-to-KG ratio can do on this sort of gradient, needless to say I need to lose a few more KG to bring my ratio into line.. I was doing ok on this first part of the climb, decided to zig-zag a bit to cut the gradient, and this is a place you can do it until some pesky cars start coming up from behind.. The first part is a steady 9-10% grade incline that lasts about a quarter mile, then it levels off to about 1-3% grade for about another .1 mile, before the steepest ramp at about mile 5.6, here the grade kicks up to 14-16% for a few hundred yards. This is where you will likely feel the maximum effort,my HR was pegged at 174bpm which for me on the bike is very very high.. but with a few nearby competitors suffering just as much you can understand why. Eventually the road levels off and the left hand turn at the top means your mostly done with the serious climbing..
From here its a bit of rolling terrain , a little bit more climbing, before you see the S-turns which means you’re about to be deposited onto a nice smooth long straight downhill of Route 173, that’s about 3-4 miles of 30-40+mph speeds, my legs felt a bit like jello on the downhill as they recovered from the climbing effort… just try and relax and gain some well deserved respite so you can finish off the rest of the course, at the end of the downhill its a left turn which leads you back into the park for another 3 or so miles, from here its mostly downhill. From the park entrance to T2 its about 1/4 mile plenty of time to undo shoes..
After racking my bike, I grabbed my run gear and headed out on the run. the run course was again different this year, leaving T2 you head straight this year running a counter-clockwise route. . At this point I still hadn’t seen Jose, with no mechanical issues this year (last year my chain fell off at the steepest section) I assumed I had put some more time into him.. .
At about the 1.3 mile mark of the run, at the boat launch turn around, different layout from last year, , we just ran on the same road and did a 180-deg turn at the cones. I purposely hadn’t turned back to see if my brother was behind me.. At the turnaround I immediate, started scanning the runners for tell-tale signs of Jose, but nothing. So from here I knew every footstep I ran without seeing him, it meant I was putting more distance between the two of us. So I kept up my 8- 8:20 or so pace , still not seeing him. Eventually I saw his trademark white cap in the distance, and by this point I knew with only about a mile left he would be hard pressed to catch me., he still had 2+ to go. So a brief hi-5’d him as we passed and then it was onto the finish, to punch the air and smile knowing I redeemed myself this year. A few moments later I saw our friend Leslie as she wasn’t too far behind Jose on the run course. Here’s a short 11-minute video recap of our race. 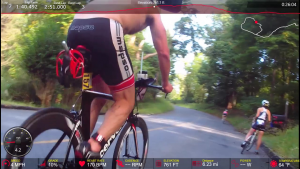 Video has Garmin metrics added to Bike and Run portions. 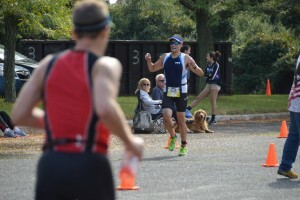 This year it was my turn to cheer my brother onto the finish as he crossed the line about 4 minutes behind me. I was pretty happy about regaining my bragging rights for this year, but I know my brother will be back to challenge me again.. it was nice also to see Christine’s friends Lesley and Nick and afterwards we stayed a bit for food and the awards ceremony. 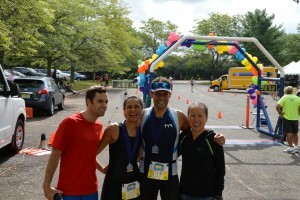 Nick, Lesley , Tony and Christine post race.. I can’t say enough good things about the Rotary club that organizes this race, they do a fantastic job, on so many fronts (water safety, volunteers, USAT officials, post race food, podium etc..).. Most importantly of the Rotary club donates portions of the race entries go directly help out the local community, this year they highlighted support for helping local homeless veterans and special olympics, just an overall positive experience. Definitely add this race to next year’s race calendar..